If there is one place on earth you should visit to get an eyeful of gorgeous people dressed to perfection then Pitti Immagine is still, hands down, the ultimate destination for a fashion trade show. I-AM was at the latest instalment, number 88 to be exact, to see a collection of some of the best brands from high street to high end gathered together in the grounds of the old Fortezza da Basso (fortress) for three-days of full-on fashion. With emerging shows gathering pace, such as CIFF in Copenhagen, Pitti has almost taken on the mantle of the ‘older, less cool’ brother, but judging by the vibrancy, colour and style on show, it is anything but a tired offering. Perhaps lacking in the draw of the Scandinavian aesthetic set against minimalist modern backdrops or the raw edges of Brick Lane and the Truman Brewery, Pitti certainly can be considered the most polished and sophisticated of the lot. During our stay in the picturesque Firenze area of the city, the streets of Florence were awash with men decked out in the boldest of colourful get-ups – the sunny climate lending itself to yellows, pinks and reds topped with the customary Fedora or softer Panama hat. Walking to the Fortezza Da Basso is an experience in itself, as you get closer through the stunning gardens you become part of a very strange organic catwalk that picks you up in a wave and delivers you to the opening gates of the show past awaiting photographers. 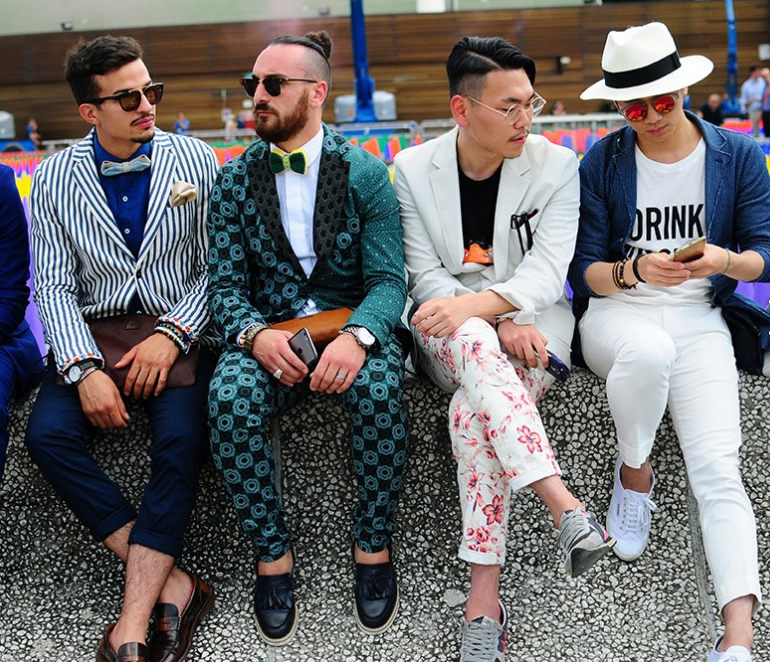 Pitti is unashamedly all about what you’re wearing, there’s no question about that. However, it is also a beautifully planned and immersive showcase of established and emerging fashion brands, well-mapped out and in the hot, stunning surroundings the ideal location for fashion industry networking. There is a lot of catalogue posing and posturing – this is Italy after all – but for some reason it seems far less arrogant. There is clear effort put into dressing and a proud, genuine interest in fashion. There were children as young as 13 decked in beautifully tailored suits with bow-ties and short-cropped trousers complete with the latest Nike trainers. As you leave Pitti, it is with a heavy heart. The experience of being in and among beautiful people is underrated. It’s actually good for the sole.